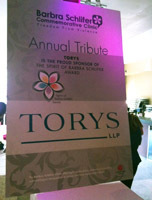 Torys is pleased to announce that we are the sponsor of the new Spirit of Barbra Schlifer Award. The award will recognize a woman who has made a demonstrable contribution to increased access to safety and justice for women. Nominations are currently being accepted, and the award winner will be named in 2013. The award was announced by the Barbra Schlifer Commemorative Clinic, which held its 18th Annual Tribute fundraising event on June 7, 2012 at C Lounge in Toronto. Hosted by Suhana Meharchand, host of CBC News Now, the event attracted supporters from the business, government and legal communities. Linda Plumpton spoke about Torys’ sponsorship of the Barbra Schlifer Award and of Torys’ long-standing support for the Barbra Schlifer Commemorative Clinic. Founded in 1985, The Schlifer Clinic is a counseling, legal, interpretation, information and referral service for women who are survivors of violence. It is named after Barbra Schlifer, who was tragically killed on the day of her call to the Bar of Ontario. The clinic works with individuals and community organizations, as well as medical, legal and criminal justice professionals, religious organizations and those concerned about violence against women.